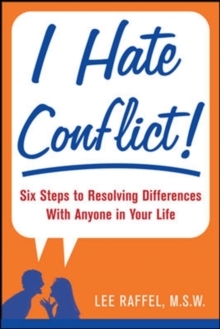 Got a conflict? Confront with confidence!Most people hate conflict. Whether it's a minor clash with a close friend, a falling out with a family member, or a big blowup with the boss, most of us would rather walk on eggshells for days, months, even years than deal with the issue head-on. But avoiding unresolved conflict can drain your energy, wreak havoc on your emotions, and destroy your health. That's why relationship expert Lee Raffel created this researched-based program to help you handle your personal and professional conflicts with courage, confidence, and sensitivity. Her simple seven-step plan will show you how to:Stop avoiding issuesStart addressing problemsTalk out feelings and issues calmlyListen compassionatelyDefuse explosive situationsDeepen your relationshipsBy using conflicts as an opportunity for positive growth and change, you'll be able to improve your relationships, lower your stress levels, and ease your mind. I Hate Conflict! 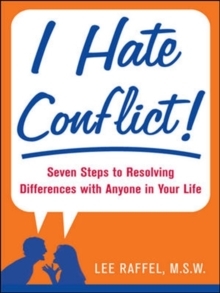 includes practical advice on how to keep arguments from escalating, how to deal with someone who sabotages conversations, and how to adapt to each of the five most common conflict styles.